Anna Maria Mazzetti (G.S. Fiamme Oro), reduce dal podio a Karlovy Vary, allunga la striscia positiva in Coppa del Mondo chiudendo al secondo posto la tappa cinese del circuito mondiale. Alla World Cup di Weihai (Cina), l’azzurra chiude al secondo posto la prova su distanza olimpica alle spalle dell’americana Taylor Spivey e davanti alla spagnola Miriam Casillas Garcia. Gara da protagonista quella della Mazzetti, uscita a ridosso della miglior dall’acqua e autrice di una solida seconda frazione durante la quale si è spezzata la gara: il finale è stato animato dal duello con la Spivey, capace poi di staccare l’azzurra nel finale involandosi verso la vittoria. Alessia Orla (DDS), bene nel nuoto, ha chiuso al 21° posto. In ambito maschile, si è imposto lo scatenato norvegese Gustav Iden, autore di una clamorosa frazione run, che ha preceduto lo spagnolo Antonio Serrat Seoane e il britannico Alex Yee. Nono Alessandro Fabian (Tri Dream), uscito quinto dall’acqua, nelle posizioni di testa lungo l’impegnativo segmento ciclistico, e capace di difendere la top-ten nei 10 km di corsa. Gregory Barnaby (707) e Gianluca Pozzatti (707), con il gruppo principale per due frazioni, chiudono rispettivamente al 17° al 22° posto. “L’avvicinamento alla gara non è stato dei migliori, avevo il torcicollo e il dolore era fastidioso anche nel riscaldamento, ma grazie al supporto dello staff sono partita con la giusta motivazione - racconta Anna Maria Mazzetti - Ho nuotato bene, sapevo che la Spivey avrebbe provato ad attaccare in bici, ma io ho cercato di non farmi sorprendere. A quel punto, dopo il suo affondo, ci siamo ritrovate in sei davanti e siamo andate via in maniera molto regolare. A piedi le sensazioni sono state buone, sono riuscita a rientrare sull’americana che si era avvantaggiata prima della T2 e sono riuscita ad ingaggiare un bel duello con lei anche se mi ha staccato a 400 metri dal traguardo. Ho centrato un altro podio, sono davvero contenta”. “Gara piuttosto dura, percorso impegnativo con una salita lunga in bici che ha fatto un po’ di selezione - ha raccontato Alessandro Fabian - Il nuoto non ha fatto la differenza, ma il primo giro di bici è stato impegnativo. Per me, corsa leggermente sotto tono, ma tutto sommato va bene aver centrato una top-10 utile per prendere punti per il ranking olimpico”. 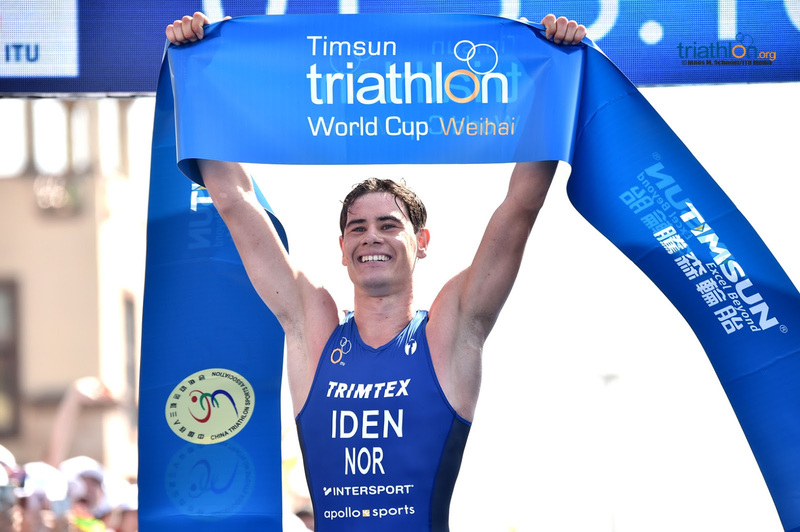 In a hot Saturday morning along the coastline of China’s Shandong Province, the 2018 Weihai World Cup saw two superb champions as Norway’s Gustav Iden and USA’s Taylor Spivey took the tape. The sun was relentless and the bike course similarly sapping, but it was Spivey who set the tone for the day with a gutsy win to finish ahead of Annamaria Mazzetti (ITA) and Miriam Casillas Garcia (ESP). Iden then powered the bike section of the men’s race to make light of a post-swim gap to the leaders, hammering on home to finish ahead of Antonio Serrat Seoane (ESP) and Alex Yee (GBR). The men were first onto the beach for the start of only the second ever Weihai World Cup, and the crowds were out in force anticipating a fascinating battle on the bikes with a field packed with strong riders. Jorgen Gundersen had put himself into a useful lead over the likes of race number one Martin Van Riel, Russia’s Dmitry Polyanskiy and Italy’s Alessandro Fabian, but the top-ranked Belgian was back into pole position by the time the athletes had made it through T1. The bike segment then unfolded piece by piece, the long climb and fast downhill slowly shuffling the pack as Van Riel, Fabian and Spain’s Serrat took control of a big lead group of more than 20 riders. Also right in there were Great Britain’s Sam Dickinson, silver medallist at the U23 World Championships, and Alex Yee, also arriving from what was his first Olympic distance race at the Gold Coast and clearly enjoying himself in the front group. Gundersen made his move with two laps to go and went on a solo breakaway, coming out of T2 with a ten-second lead ahead of Germany’s Jonas Schomburg and 35 seconds on the main pack, but it only took one 2.5km lap for the likes of Van Riel, Serrat, Yee and Lasse Luhrs to make up the gap. With the heat bearing down on the athletes it was Iden who rolled the dice first, pushing out ahead and dropping Yee and Serrat with one lap to go. As the Norwegian hit the blue carpet he was able to enjoy the final few hundred metres to the line and soak up the cheers, while behind him the Spaniard managed to hold off Alex Yee to claim second, bronze for the Brit on a first World Cup podium, firmly underlining his credentials as a talent for the future. Germany’s Luhrs came home fourth with Spain’s Vicente Hernandez fifth. The heat had cranked up a notch by the time the women took to the sands of Halfmoon Bay, but that didn’t deter Japan’s Yuko Takahashi as she attacked right out of the first strokes to lead a strong front group along with Hungary’s Zsanett Bragmayer, USA’s Tamara Gorman and Iceland’s Edda Hannesdottir. Takahashi sailed through the long transition, but with 18 athletes all right behind her it looked likely a huge pack was ready to form. That wasn’t to be how it played out, however, and whilst Miriam Casillas powered forward to work her way into contention alongside Spivey and Takahashi, others fell back, leaving a six-strong lead pack that by the second lap had already amassed a 70-second lead over a train of chasers that included Chelsea Burns and Kaidi Kivioja. The leaders continued to stretch that advantage, Bragmayer, Austria’s Lisa Perterer and Italy’s Mazzetti all playing their part in opening up more than two minutes on those behind, who had seen Mexico’s Claudia Rivas put the hammer down solo to try and close the gap. It was too late by then, however, and Spivey once again gave herself some room with a speedy descent into transition, opening up a slender lead over the other five. Mazzetti was the only one able to hold on to her heels and the pair proceeded to battle for much of the 10km course, while behind them Casillas had managed to drop Perterer and Takahashi. By the time the blue carpet came into view, Spivey had managed to accelerate away from the Italian and her first ever World Cup gold was in no doubt. Mazzetti continued her strong return to form with second place, Casillas coming home in third. Perterer held off a spirited late charge from Japan’s Ai Ueda as they finished fourth and fifth respectively. Swim - 1500m - Halfmoon Bay, 2 laps. Ocean conditions. Possible wetsuit swim. Bike - 40km - Asphalt, seaside roads, hills, and corners, technically challenging. Six laps of 6.7 km each. Run - 10km - Asphalt, flat roads, and seaside wood path, 4 laps.